This past Saturday, after much anticipation and cumulative hours over the last three months sharing messages of hope, fear and excitement, nuanced with begging and pleading for attention and support with my friends, family and online followers alike, I finally had my book release. Phew! 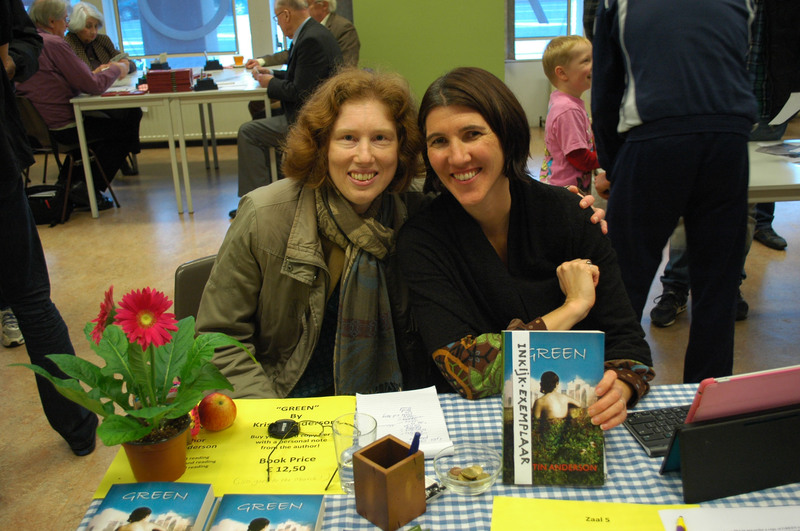 You can all wipe your collective brows and know that Author Kristin Anderson’s launch of her debut novel GREEN is now over. But as my friends are now pointing out, my work as an author, has only just begun. 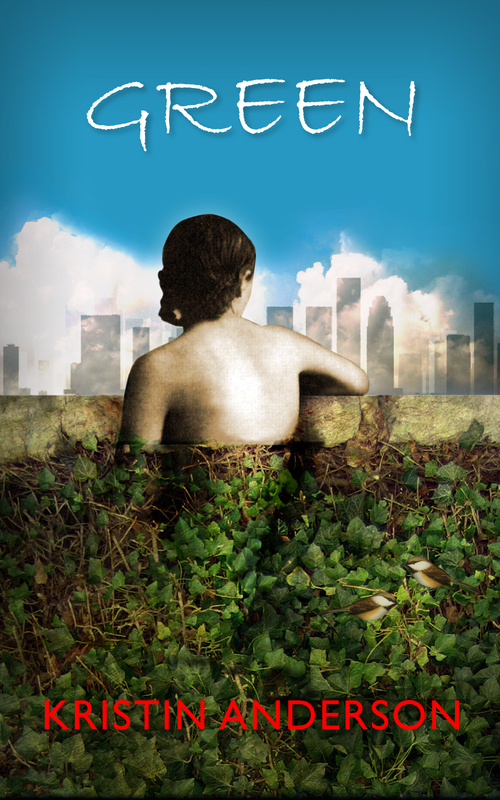 Now I need to get the world to realize my “debut-novel Green by Kristin Anderson” has been released, that it is receiving great reviews and should be in that stack of books on your bedside table, or in your kindle library. Well, before I begin that journey, I thought it might be fun to share the highlights as well as the strange events that occurred during my book launch this past Saturday, November 16th. Earlier in the week I thought about contacting my friend Welmoed, owner of Orange Gloss Styling, for her opinion on the best booth location from a Feng Shui perspective. This was the first sign that I was taking this whole thing a little too seriously. (But that was a brilliant idea, wasn’t it?) The night before the launch, my friend Bo Rodenhuis came over and rummaged through my tired collection of clothing with her fashionable eyes. As if invoking some fashion voodoo spell, she created a clothing combination I would have never come up with on my own, and voila! Style! I awoke Saturday morning with feelings reminiscent of childhood Christmases–I couldn’t wait to jump out of bed and start my day. With the whole “Oh-dear!-what-am-I-going-to-wear” dilemma eliminated, my morning routine was a breeze. 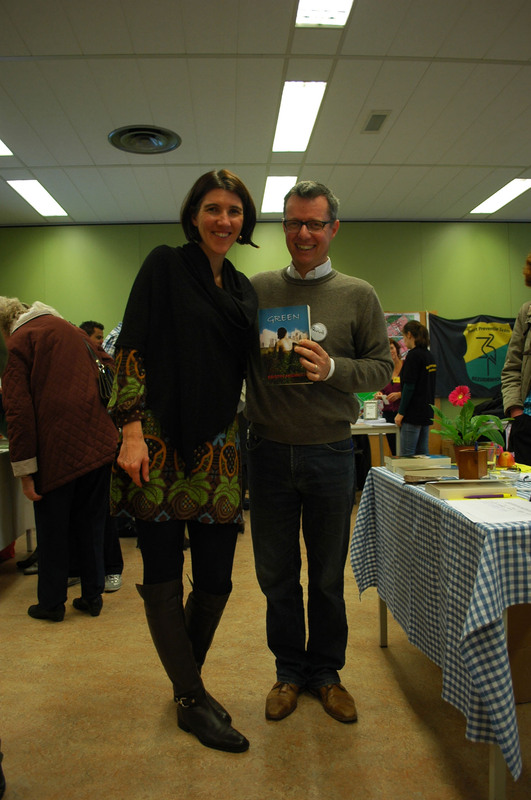 My book launch was held at the Christus Triumfatorkerk in The Hague, The Netherlands, as part of the BezuidenhoutFestival– a neighborhood-centric festival for local clubs, politicians, and community leaders. There were a handful of groups selling handmade items, locally made honey, bridge clubs, a neighborhood watch program, a flower project, politicians and me. Even though the idea for my book was conceived in Santa Barbara, California and set in Los Angeles with a contemporary opposites-attract plot with the Deepwater Horizon Gulf Oil Spill looming in the background, it could not have been more “locally made.” ; I wrote 80 percent of this book in the Bezuidenhout, The Hague. To my surprise, friends from just about every hook of my social life here in the Netherlands materialized. 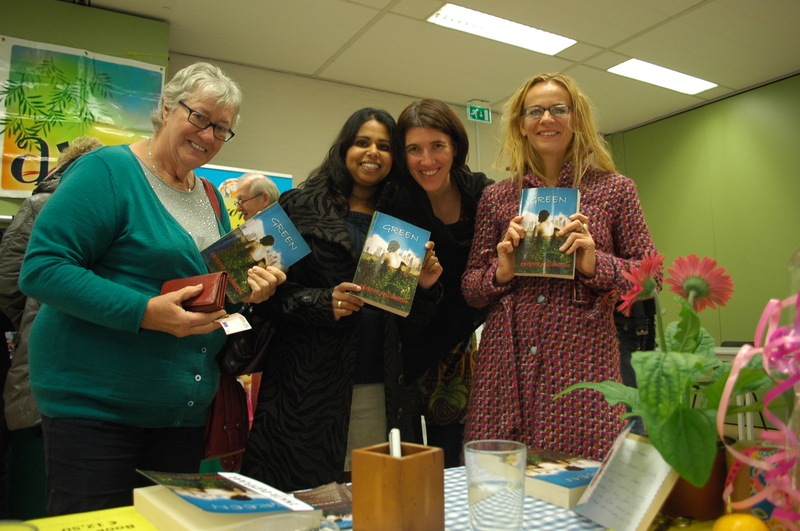 They brought offerings of flowers and candles, body lotions and kind words, along with euros to purchase my debut novel. Sister and brother-in-laws, in-laws and nephews joined the celebration. People I didn’t know who had come to the festival attended my book readings along with my friends and family, and even purchased my book. People stood in line for me to sign. This one day felt like a little movie of how I would like my life to be; how it would feel to be a full-time author–how right that would feel. Funny how just a few hours being in one role can change your life perspective. 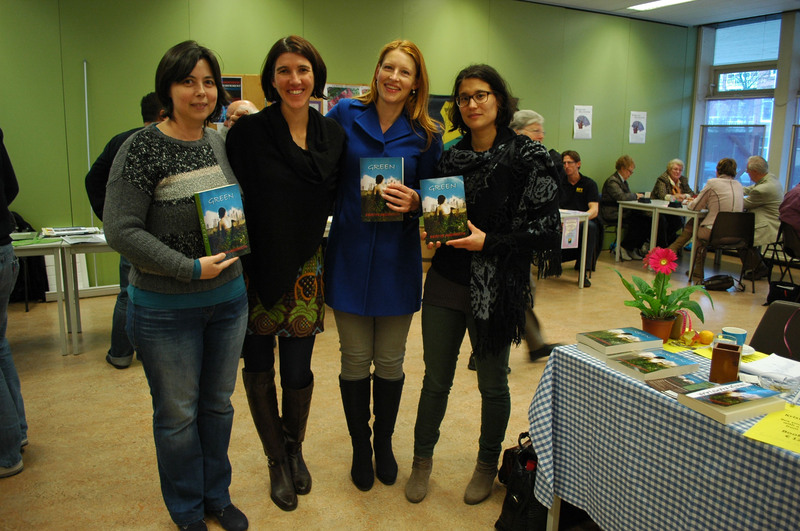 Variety of friends purchasing my book! Considering my eco-romance novel is set in Los Angeles, and is written by an American, it only makes sense that I needed to focus my launch on the U.S. market. Yet, I currently live in the Netherlands. So, I attempted to use some of the social media skills I’ve been learning in Zestee online media school, and create a virtual book launch as a counterpart to my physical launch here in the Netherlands. But what is a virtual launch? Was the resounding question. My definition is that during the time of your physical launch, you post updates on your website or facebook author page, and plan a group chat through Skype or Google+ hangouts for a hands-on, interactive experience. I decided on Google+ hangouts. It boasted being able to chat with up to 10 people at a time, and I could even make it public, in case Maria Bustillos or another L.A. Times book reviewer might want to join in on the streaming conversation / video and interview me about my fabulous new genre eco-romance. So, I decided to make it public. It took me the better part of a week to figure out how to do a public chat, but I did it! And boy, was I surprised what a public hangout on Google+ could bring! My first caller was published Santa Barbara author Leslie Westbrook. She’s the real deal, with an agent and multiple titles, and also just an all around friendly person that I knew when I lived in Santa Barbara. While we were talking about the dramatically changing landscape of the book industry, Yuri from the Ukraine joined our conversation. Leslie and I were having Blair Witch Project style flashbacks as Yuri’s toddler grabbed the camera and twirled it around, giving us a seasick overview of the strange warehouse setting where they stood. I tried to politely explain to Yuri that I was doing a book launch and that he was about to make me lose my dinner, but he only wanted to talk to us, and not listen. I quickly discovered the ignore button, and Yuri was no longer in the conversation. Within a few minutes, another user joined the conversation. But instead of seeing a person, a strange icon appeared, which twirled in circles. The optimist in me considered for a nanosecond that this could be someone genuinely interested in my book. But when he didn’t speak or respond to my conversation, the pessimist in me imagined this spinning disk to be some sort of computer sweeping device munching through all of my files. I quickly discovered the “block sender,” button. Soon a message appeared from said sender that was extremely aggressive, sexist and derogatory because I had blocked him from my conversation. Thus the concept that rules of civility don’t always apply in these non-policed arenas of online interaction. I closed my session and re-logged on in a private chat, inviting only friends. And friends came to hang out with me. They joined the conversation over the next few hours. 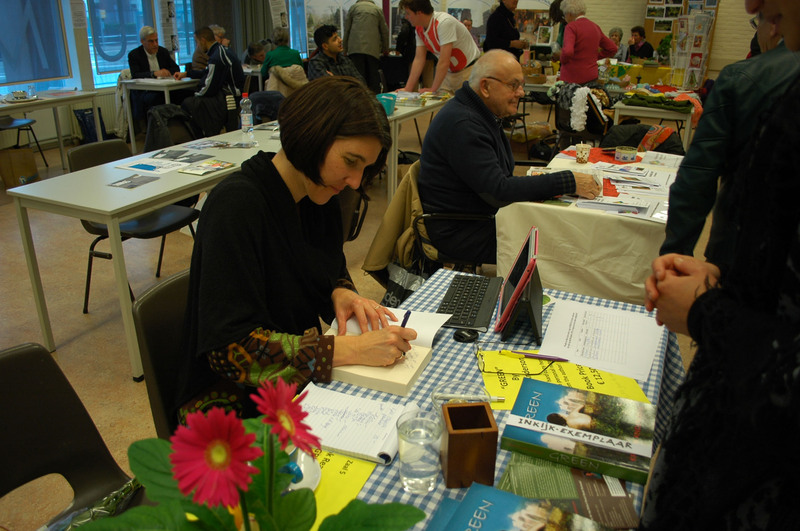 As contemporary nomads, many of us author types have friends in various regions of the world. Thus, a virtual launch with a real-time media component, such as Skype or google+ hangouts is very handy. But before you consider doing a virtual launch, I recommend having a method to screen participants.